Meet my second dish in the Simply Asia Summer Recipe Challenge: Ginger Meatballs! I was asked to create three dishes- an entree, appetizer and side dish. These Ginger Meatballs are my appetizer recipe submission. I made Spicy Shrimp & Vegetable Stir Fry as my entree. I have to warn you that these meatballs are addicting! I couldn’t stop at just one. If I was making them for a party, I’d have to make extra because they are so yummy! In this recipe, I use fresh ginger, but you could use ground if fresh ginger isn’t available where you live. 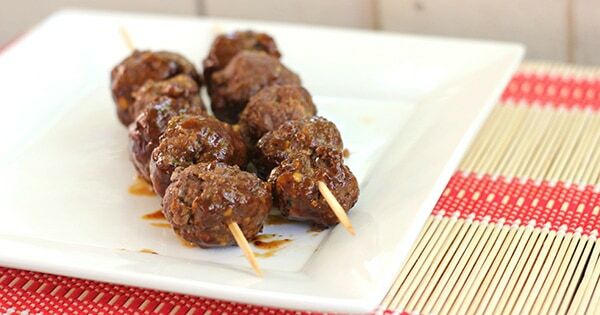 Add a bit of Asian flair to your meatballs! Preheat oven to 350 F. Line a baking pan with aluminum foil. Mix egg, bread crumbs, garlic, ginger, water and Sweet Ginger Garlic Seasoning in a large bowl. Add ground beef to the bowl and mix together with clean hands. Roll meat mixture into 1 inch balls with your hands and place on the baking pan. Bake for 25 minutes or until the meat is cooked and no longer pink in the center. Let cool 5 to 10 minutes and then add meatballs to a saucepan. Gently mix in General Tsao Stir-Fry sauce and heat over medium low for about 5 minutes. 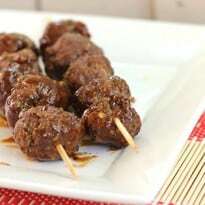 Serve by skewering meatballs on wooden skewers or by putting a toothpick in the center of the meatball. Makes about 24 meatballs. These look yummy and the recipe seems easy to do. Great for parties. have you possibly tried these with ground chicken or turkey? No, but I bet they would be tasty! Not even ground turkey or chicken – I bet you could make some with Seitan. Regardless, another great entry from you! Those Ginger Meatballs sound delicious.I’ll give them a go. They sound delicious!!! I an taste them now! These look and sound like yummy meatballs that would be great for parties. I think I may put a piece of fresh pineapple in between each meatball as I love fruit too. I am definitely going to try…I really like Ginger added to recipes and these look delicious. I like any kind of meatballs so I’ll have to try this. And, I voted for you! The Asian sauce looks so versatile. I was vote 135, love the idea of a different twist on meatballs (even though I don’t eat meat!). These actually look really good I’m not a ginger person, but I would so make these for my husband! i have got to make these. they sound wonderful. These look great. Plus they are easy enough to make. I think these would be great to bring to a potluck. Thanks for the recipe. I have a ton of left over rice that these would go great with! I have tried just a few of your recipes and they are very flavorfull. These looks yummy, I’ll have to try them when I make my stir fry. they would be great as an appetizer. These sound amazing! Adding them to my to try recipe file. Love meatballs but never made my own — thanks for this wonderful easy recipe! Looks yummy! I’ll have to try and found that sauce…have you ever tried to replicate it without using the packaged mix? No I haven’t but I bet that would work too! I just recently started liking ginger, so I would love to try these. Thank you for this recipe! Ginger is so wonderful to cook meat with, and its good for you too! Oven ever been big on meatballs, but Hesse sound wonderful. I like that you can substitute ground ginger for fresh. A great recipe for a group or just for your family to snack on. I like this recipe!My husband loves meatballs,so I will be trying this soon.They look very easy to make and would great for parties.Thanks for sharing I am pinning this recipe to keep. Looks delicious, I would substitute chicken or turkey for beef though. these look sooo Good. All of your reci0pes look soo tasty! This looks really good — thank you for the recipe.. I think that this is my favorite of the 3 recipes . I shall have to make it soon to see if it live up to my expectations! These are my daughter’s favorite flavors. I’m pinning this now, so that I can cook these when she comes to visit! these look so good! and i love cooking with fresh ginger, it makes a big difference! mmmm these look fabulous! Thank you for sharing! I’m going to make these for my next family get together. I’m positive they will be a hit with everyone.